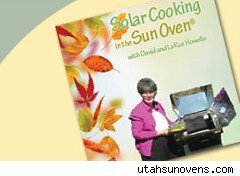 Get a free solar oven DVD that covers how to set up and use a solar oven courtesy of Utah Sun Ovens, a company that makes solar ovens but does not sell them directly. The DVD normally costs $13 plus shipping. Share your name, address and e-mail to get the freebie. It's unclear how many DVDs they are giving away. The DVD has tips -- like always cook with a dark pot -- and has basic guidelines for first timers. It also includes recipes to bake bread, make gumbo and bake cookies. Aside from cooking, did you know a solar oven can dry fruit and help plants sprout in winter? Get a video preview by clicking "See How It Works" on the left side of the screen that comes up through the link above. I got sucked into the preview video by the narrator's voice, which is quite soothing. The speaker, unfortunately, does not say whether solar ovens are powerful enough to work in winter, so I'm going to leave this freebie for folks who live in warmer climates. Thanks, Free Stuff 4 Free! Check back later today and through the week for more great deals at WalletPop.com.